BloodyElbow has provided coverage of the UFC Anti Trust lawsuit that is second to none. In their ongoing coverage economist Paul Gift, who is experienced as an expert witness in anti trust lawsuits, dissected the claims and provided a unique breakdown. The fighters’ strategy has just been clarified. If a credible economic argument is to be made about raising rivals’ costs with exclusive contracts, they must be long term. This is an absolutely essential component to the story. In my experience, exclusive contracts in the range of three years or less are usually viewed as short term. 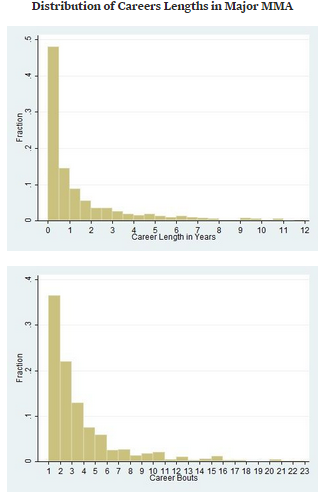 4-8 years is debatable and 8-10 years or more is generally viewed as long term. This is because contracts don’t expire all at once. They’re generally staggered. I once worked on a case where a company foreclosed 100 percent of a critical resource from its competitors with exclusive contracts. That foreclosure rate is insane, but the length of the contracts was the critical component. They averaged about five years which meant around 20 percent would expire and become available for free and open competition every year. The defendant won the case partly because the contracts weren’t long enough to put its rivals at a sustainable competitive disadvantage. In what follows, I’m going to use the Eddie Alvarez contract as a baseline. The term of Alvarez’s contract was the earlier of 40 months or 8 bouts. So the worst-case scenario is a length of 3 years 4 months as long as he’s reasonably active. This puts the plaintiffs in a real bind as they’re going to have a hell of a time showing that 3 years 4 months is long term. The complaint reveals that they likely know this and their strategy will be to downplay the contractual term (“Regardless of the term of the agreement”) and focus on the extension clauses (“thereby effectively extending the exclusivity provisions indefinitely”). I don’t take anything away from Gift’s expertise and perspective, however, context is always important. While three years may not be a long time in the labour market generally, in the realm of ‘elite professional MMA’, three years may be a lifetime. If the Court finds that the average UFC contract length mirrors the average professional athlete’s time in the elite league the exclusive time period will be all the more problematic considering the crux of the Plaintiff’s allegations is that the UFC prevents fighters from enjoying reasonable access to true free agency during their short careers. If you are following this lawsuit you can expect this topic to be acutely studied. I have reached out to several people for statistics on the average tenure of a fighter in the UFC in the Zuffa era. I don’t have an answer but if one is provided to me I will update this article to help add context to the issue of fighter exclusivity in the face of this anti trust lawsuit. Update December 30, 2014 – Paul Gift was kind enough to reply to this article and provide the requested statistics. I encourage anyone following this story to read Paul’s article along with the comments that follow (including John Nash’s comments citing USA v. International Boxing Club of New York which is likely one of the template’s for the Plaintiffs claim).